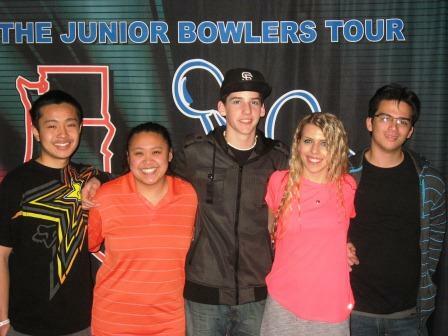 A tough Northern Calfornia quintet shot lights out to capture the Team title at the 2012 JBT Las Vegas Main Event, hosted by Texas Star Lanes and sponsored by Ebonite International. Jon Nakagawa led the team with a big 743 series, Michael Gonzales blasted 720, and Forrest Kritzer contributed a nice 646. Anyone who follows our Tour knows that the girls have no fear of competing against the guys, and the ladies more than did their part to win, with Nichole Hiraoka rolling 690, and eventual Girls Scratch Singles champ Brittany Hillman rounding it out with 620, for a huge 3419 total, winning by over 100 pins.